Midwest Winter Weather Blog: The Beginning of an Active Pattern for the Midwest? The Beginning of an Active Pattern for the Midwest? A series of Alberta Clippers ranging in intensity will be the story in the world of weather for the Midwest, at least for the next week or so. Let start with the first system. It is already developing near the Pacific Ocean, however will not carry much moisture with it. 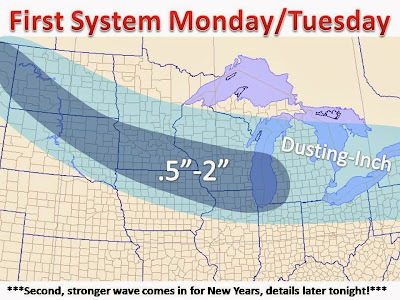 Most totals will be around an inch of fluffy snow by Tuesday morning. With temperature in the single digits, road crews will face difficulties as most salt treatments will not work at such low temperatures, leading to a slick commute Monday evening and Tuesday morning.